This collection of 101 festive holiday stories will warm readers&#8217; hearts and spread the wonder of the holiday season with its tales of love, joy, and awe. A fantastic holiday gift and a great way to start the season! Christmas is an exciting and joyous time of year, a time of family, friends, and traditions. You will delight in reading the 101 merry and heartwarming stories about holiday traditions, family, and goodwill. Remember, all our stories are Santa safe so they can be enjoyed by the whole family. 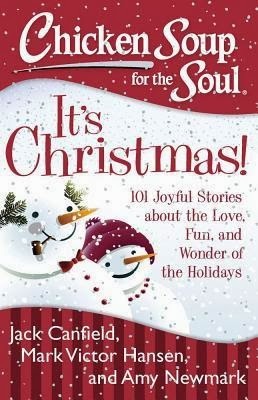 Chicken Soup for the Soul: It's Christmas gives you over 100 short stories about love, fun and stories about the Holidays. This is definitely one of my favorite times of the year. I enjoy getting together with my family and friends and sharing memories and stories with one another. With this book I was able to relate to a few stories, laugh at some and tear up reading some of the stories. It's a great book with filled with amazing stories that will inspire you and get you in the Holiday spirit. Whether or not you have five minutes free or more, you can enjoy this book wherever you are. I love that I can read a few different stories as I wait for my kids at a doctor's appointment or while sipping on tea on a rainy day. Each story is broken down into different sections that are listed in the table of contents. You have stories under The Naughty List, Making Memories, Bittersweet Christmas and more. Definitely a great book to read over the Holidays that will have you being thankful for your life and the people in it. Disclosure: All opinions are my own. I received Chicken Soup for the Soul: It's Christmas at no cost for the purpose of this review. No other compensation was received.